The global military exoskeleton market is fragmented in nature. A noticeable trend in the market is the focus on research and development by many players to come up with improved industrial and military exoskeletons. In the foreseeable future, the players are expected to resort to mergers to tap into new markets and enhance their product portfolio. This in turn will help them tap into newer markets and acquire a much larger customer base. All such activities by keen companies operating in the global military exoskeleton market will likely intensify competition in the near future. A report by Transparency Market Research predicts the global military exoskeleton market to register a robust 14.4% CAGR during the period between 2017 and 2025. Rising at this rate, the market will likely attain a value of US$3,042.4 mn by 2025-end from US$924.5 mn in 2016. Depending upon the type, the global military exoskeleton market can be segmented into full body exoskeleton and partial body exoskeleton. Of the two, the partial body skeleton segment is slated to lead the market with maximum share in the next couple of years. The rising number of applications of these exoskeletons is expected to help the segment rake in a revenue of about US$1,977.0 mn by 2025-end. 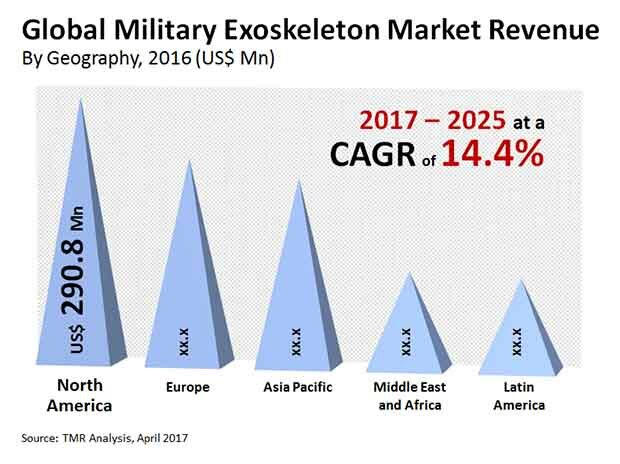 Geographically, the key segments of the global military exoskeleton market are North America, Latin America, Europe, Asia Pacific, and the Middle East and Africa. North America, among them, is a leading market whose value stood at US$290.8 mn in 2016. The market in the region is being mainly driven by the U.S. and Canada – two nations that have been pouring in money for developing lightweight exoskeletons for the soldiers. The political uncertainty and the deep involvement of the U.S. soldiers in the Middle East is mainly stoking demand for upgraded military wearable and exoskeletons in North America. Majorly fuelling the global military exoskeleton market is the rising threats to security, fragile political situations, and spike in in geo-political conflicts in different parts of the world. The exoskeleton are designed primarily for combat and they are supposed to provide the soldiers extra strength and protection in a battlefield. They also help to carry heavy loads during difficult missions such as counter-insurgency operations or rescue operations. All such unique perceived benefits are boosting their demand. In addition, the changing warfare methods, such as the emergence of biological weapons has also been helping the market for military exoskeleton as they protect soldiers from harmful gases by preventing direct contact. “The rising requirement for sophisticated communication systems for well-planned attacks will also likely underpin the growth momentum of the market. At present, companies are attempting to integrate electronics in these suits for developing suits that fit the need for modern-day warfare. Further, development of lightweight exoskeletons is predicted to improve mobility of soldiers, thereby leading to more uptake,” explains the lead analyst of the TMR report. One factor posing a roadblock to the global exoskeleton market is the steep cost of manufacturing which also drives up their market price. This makes it very expensive to procure it for the masses.